If we were to ever run out of wine in France, we might as well export castles by the wheelbarrow. It’s no secret that there is an obscene number of châteaux in this country. Do you stop noticing after a while? I won’t tell, but let me remedy this situation by shedding some light on two castles I bumped into last week, the Château de Portes and the Château d’Allègre. 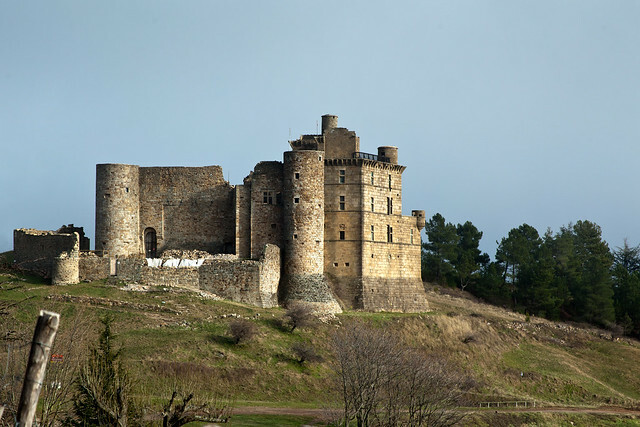 Both citadels are located in the Gard département in southern France, in the beautiful Languedoc-Roussillon region. If you are familiar with the Château de Versailles, just picture the opposite. I like my castles less opulent, more run-down. In a word, abandoned, but no less worthy of interest. Read on to smell the old stone. 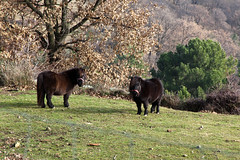 This is the third post in a five-parts series relating my winter trip to France in December 2010. In separate installments I posted photos of Chamonix by Night and by day, ambled down the roads of Uzès and Arles, and gave French food some thought. In the header and below, full frontal castle action featuring the Château de Portes. 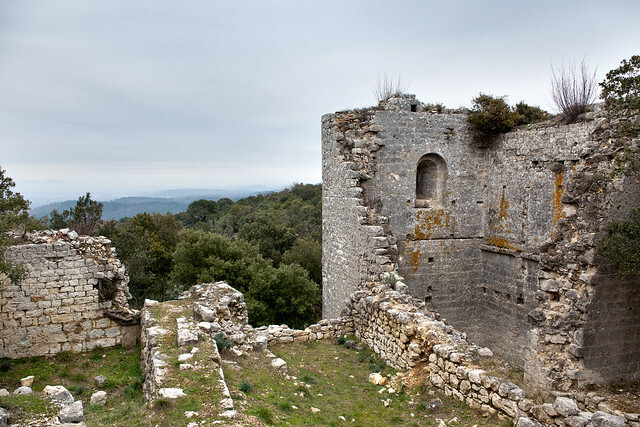 This castle, located in the commune of Portes, overlooks the Regordane, an ancient avenue used by the pilgrims of Saint-Giles and the Croisés on their way towards the Holy Land. 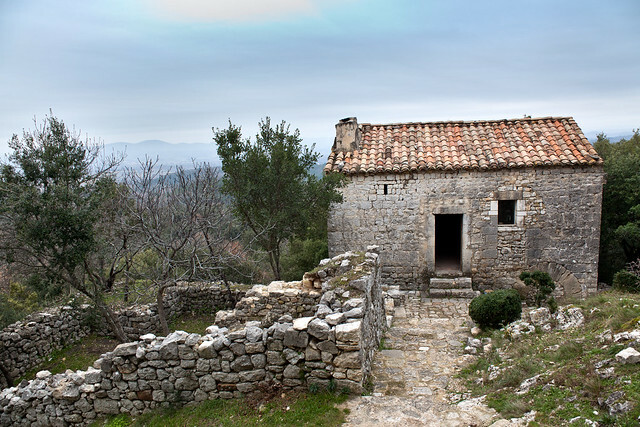 It was erected by the Anduze Barons in the XI – Xllth Century as a guard post. 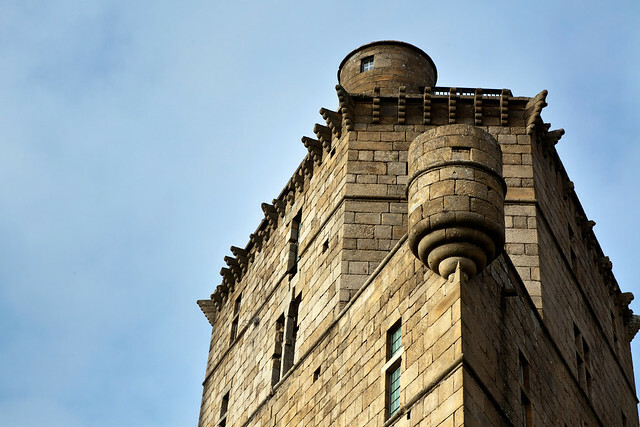 The castle has a singular architectural style among castles in Europe because of its 49 degree spurs in the shape of a ship’s bow (see below), which earned the castle its nickname of a “vessel in the Cévennes”. This structure was added in the XVllth century by Antoine Hercules de Budos, then Vice Admiral of France, when he augmented the castle in the Renaissance style. The point is turned towards Alès, the city of his enemy, the Duke of Rohan (a protes­tant leader). I found this feature really striking and aggressive. You probably wouldn’t want to mess with this castle back in the days, would you? In 1929, following the intensive exploitation of the coal mines under the site during the First World War, the ground broke causing the foun­da­tions to col­lapse and forcing its evacuation. Note to self: do not dig under a castle. You can clearly see the wall fractures above. 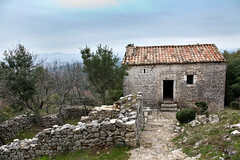 The village was rebuilt about 1000 ft. (300 m.) further. Circa 1960, the grounds were stabilized and in 1972 a not-for-profit association was created to rehabilitate the castle. 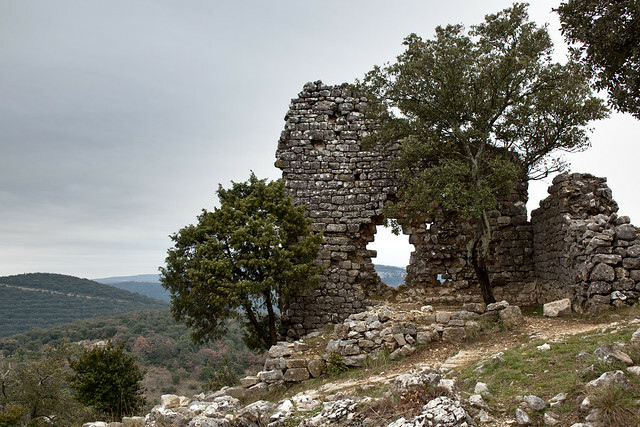 In 1314, Guillaume de Randon Polignac, in debt, mort­gaged the castle. Raymond Guillaume de Budos, the nephew of Pope Clement V, bought the seigniory in 1322, and added at least two additional flanks to the castle in 1384. 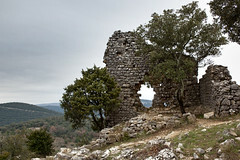 Thibaud de Budos recovered the castle after deposing his father André, who had joined with the English at the beginning of the Hundred Years’ War. That will teach you for joining the Brits, dad. The building is closed until April unfortunately, but I managed to take a picture of the courtyard above through a space between the heavy wooded doors. The seigniory became increasingly rich and powerful until Louis XII set it up as a marquisat as a favor to Antoine Hercules de Budos. The Prince de Conti inherited the castle in 1693, and his descendants sold it to Louis XVI in 1782. 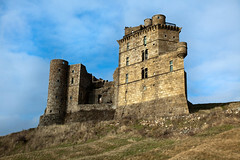 With the French Revolution, the castle was nationalized and sold to six successive owners. It was once a prison. In 1841, in the hands of the Vernede family, the monument was restored from its decrepit condition. 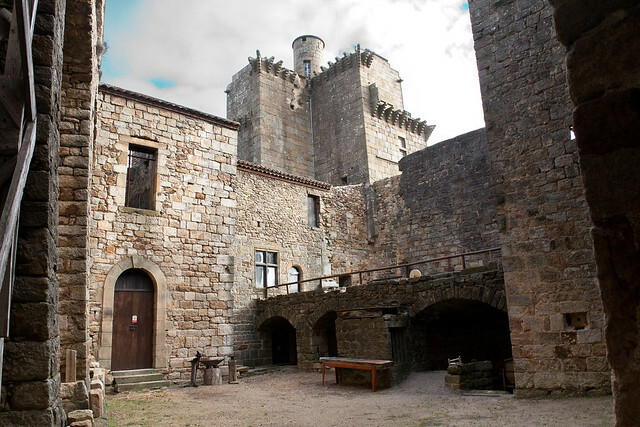 To learn more about this striking castle’s history, check the History of the Castle of Portes page on the official web site. I’m not sure what this stone next to the castle is, to be honest. There is a circular hole going straight through, and several markings on the side. My mother suggested it was a tomb, in honor of a particularly deserving worker or architect. I didn’t have a shovel with me. 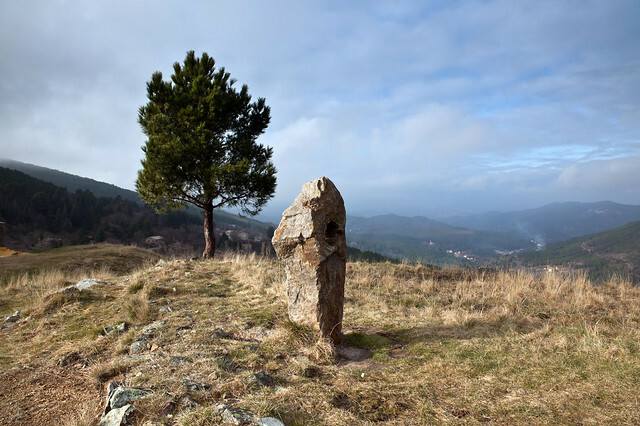 From the top of the hill or the top of the castle 100 ft. (32 m.) above ground, one can admire the val­ley, from the Mont Lozère to the Alesian plain. 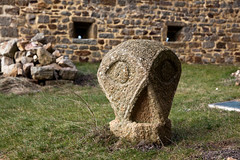 Many cul­tural events are planned all year long, for more information check the Visitors Information page. This most likely doesn’t include dropping boiling liquid from the tower. 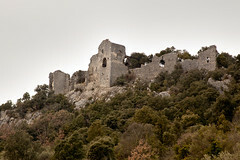 Sources: Château de Portes (http://chateau-portes.org/), Château de Portes (Wikipedia) , “ Les Chateaux du Gard du Moyen Age à la Revolution ” by Marthe Moreau, edition Presses du Languedoc, 1997 (271 pages). …or what’s left of it. The weather wasn’t cooperating that day, I had to harm a few pixels to recover the photos, apologies. The castle, first mentioned in the XIIth century, overlooks the Cèze valley. It is visible from 10 miles (15 km.) 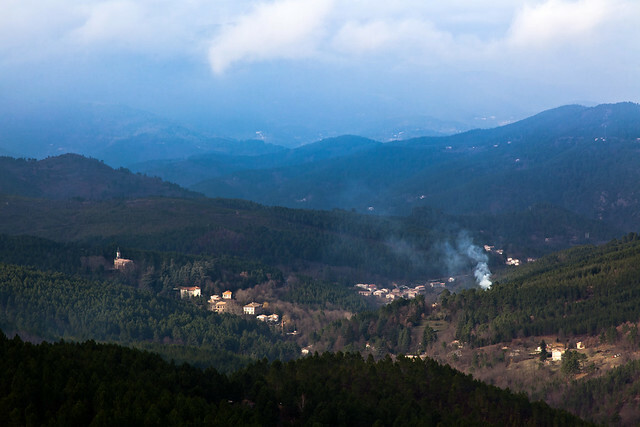 away and offers a fantastic view on the Cévennes mountains. It spans about 3.7 acres (1.5 hectares) and is the very definition of a ruin (check http://chateaudallegre.e-monsite.com for aerial photos, a map, and a very detailed walk-through). 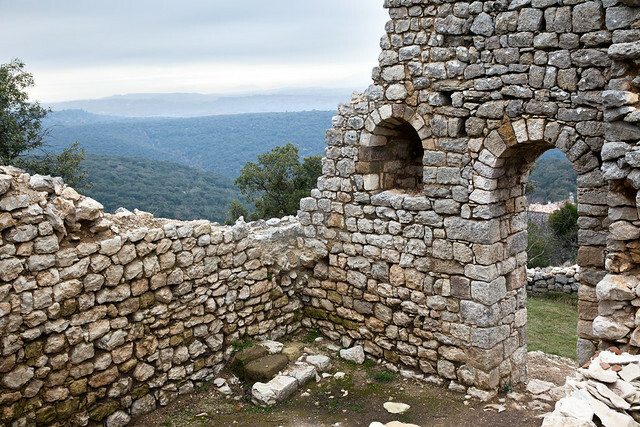 This castle, in its latest iteration, was actually a castrum, a word used by the ancient Romans to mean buildings or plots of land reserved to or constructed for use as a military defensive position. There is no known record of its creation though, and very few information about the family it is named after. 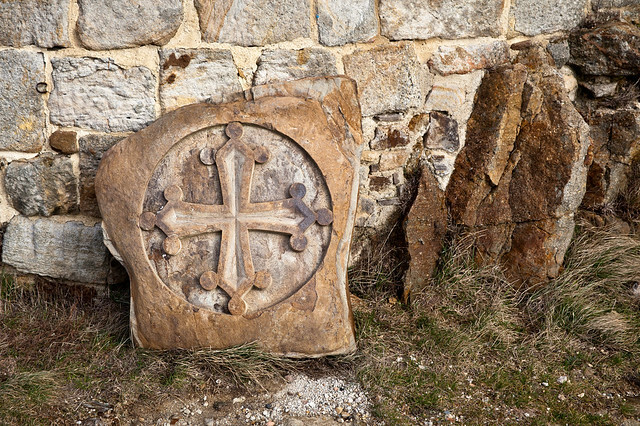 A Pierre d’Allègre was first mentioned in 1207 as a witness to a donation act made by Alphonse II d’Aragon. While the first tower was most likely built by the Allègre family originally, no less than eight co-seigniories had been established by 1313, granting towers, houses and lands to an equal number of lords. Good times. This co-seigniories state of affairs was not uncommon, but it was particularly out-of-control at this site . In that respect, this castle can be referred to as a knights village during this time period. This explosion of constructions, developments, and co-ownerships is in part explained by the prosperity blessing this region in the XIIth century. Did I mention the view too? At this point you are probably wondering, “ What the *bleep* happened to this castle, really? ” The Hundred Years’ War, that’s what. The region wasn’t directly affected at the beginning of this conflict, but saw many lords leave their seigniories to battle for the King of France. Orders were given to fortify the place and link the towers together, thus creating the aforementioned castrum, a military defensive position. By 1360 the Treaty of Brétigny, signed between King Edward III of England and King John II of France marked the end of the first phase of the war. This wasn’t quite the end for most of the population though, as disbanded and disgruntled soldiers assembled to pillage the French countryside. The Languedoc-Roussillon region wasn’t spared and often saw local lords bribe these small armies to wreak havoc in neighboring lordships. Classy. This dire situation took its toll on farmers, craftsmen and the poor alike. 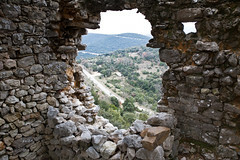 Some of them finally revolted and stormed the castle in 1383, leaving the edifices in ruins. They were pretty much exterminated. 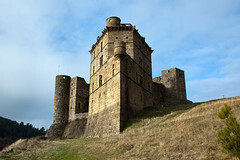 The castle was left behind by its owners in the following years. A few houses were built in the XVIIth and XVIIIth century, and a “tower” (above) was even occupied until 1910, when the site was ultimately abandoned. An association was created in 1993 to bring some life back to the castle. They gather once a month in the house above, one of the first building to be restored. 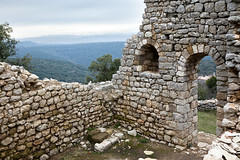 More than a hundred members help out and volunteer to clean, consolidate and secure the ruins. The association holds an annual medieval festival in July, where professional actors and amateurs relive as lords, squires, ladies, peasants and religious figures. Sources: Le Site du Château d’Allègre et le Mont Bouquet (http://chateaudallegre.e-monsite.com/). A LOT more photos here. 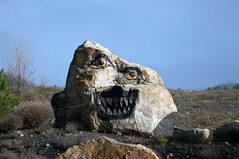 Mister Rock says “Good Bye, Thanks for reading!” Want to see more? In separate installments I posted photos of Chamonix by Night and by day, ambled down the roads of Uzès and Arles, and gave French food some thought. This entry was posted on Thursday, January 6th, 2011 at 2:03 am and is filed under France, Trip. You can follow any responses to this entry through the RSS 2.0 feed. You can leave a response, or trackback from your own site. status and your comments – thanks!